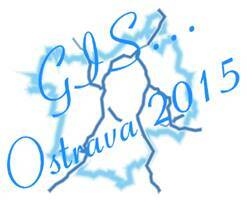 Meet us at the GIS Ostrava 2015 – Digital Surface models for geosciences symposium on 26-28 January at VSB – Technical University of Ostrava campus in Ostrava, Czech Republic. The conference will focus on the generation and utilization of digital surface models and their integration with various spatial data and models. Visit us at our Booth and get a demo of the latest version of Geoverse and learn how our latest product SOLIDSCAN is opening up new areas of applications for your business. 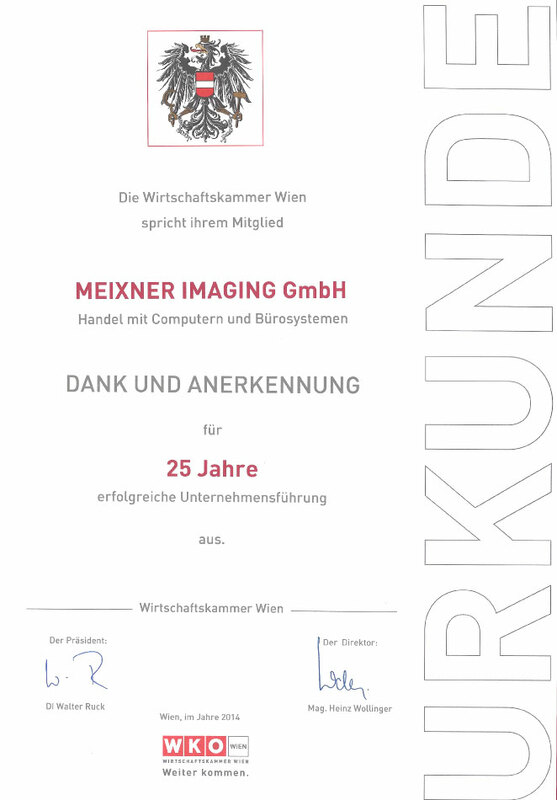 Meixner Imaging GmbH has been selected as one of the outstanding companies in Austria to celebrate its 25 years membership and successful work in Vienna/Austria. 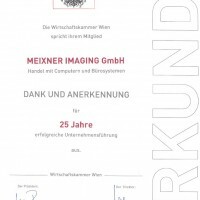 The Austrian Chamber of Commerce granted this honor to Meixner Imaging GmbH and has invited selected celebrities to join the festivity of handing out the document of honor to the General Manager of our company. Euclideon has designed solidscan to be as simple and easy to use as possible. Registered laser scanner point cloud data is easily imported into the program, adjusted, and then exported directly into a streaming UDS file that can then be placed onto any Web server or central LAN server. 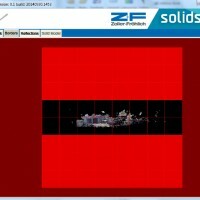 Reflections can also be added and the final result visualized in either Geoverse MDM or the solidscan Viewer application. Import raw laser scanner data from the scanner into solidscan. 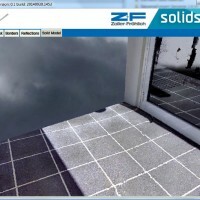 For example, we have used a project produced with a Z+F scanner containing lots of ZFS and ZFI project files. Once the project is loaded up, the SKY/MASK tab is presented. In this tab the SKY/MASK points can be marked. A default set of points is automatically detected by the scanner. A small amount of clean-up can be performed if some points are incorrectly marked as sky or mask points. This mode can also be used to mask out undesirable items like camera flash or the operator’s reflection in windows. Individual photos can also be edited in 2D mode. 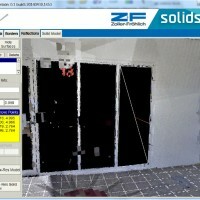 The BORDERS tab controls the extents of the final sealed solidscan UDS streaming point cloud file. 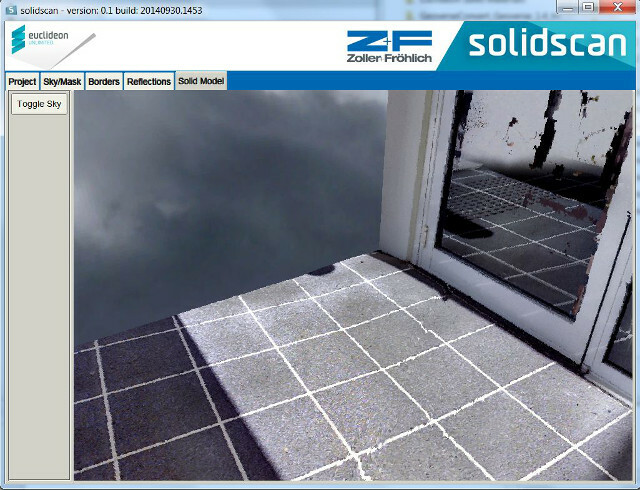 This tab can be used to constrain the point cloud and remove erroneous points around the edges of the scan. 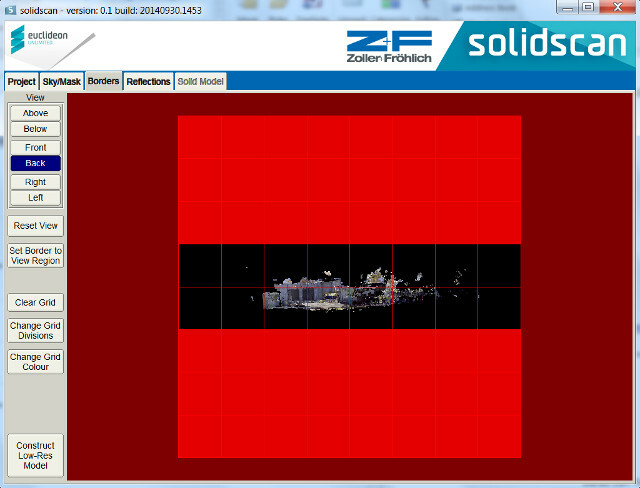 Red squares indicate portions of the 3D volume that should not be exported by solidscan. The REFLECTIONS tab allows 3D reflection planes to be defined. These are typically objects like mirrors, doors or even walls with gloss paint. Defining these surfaces is a simple process of a few clicks. These surfaces “snap” directly to LiDAR points and effectively super-impose a polygonal plane in front of the 3D points. This polygonal plane then has high-resolution photographs mapped onto it for an outstanding visual result in areas where laser scanners normally suffer issues with noise from reflective surfaces. 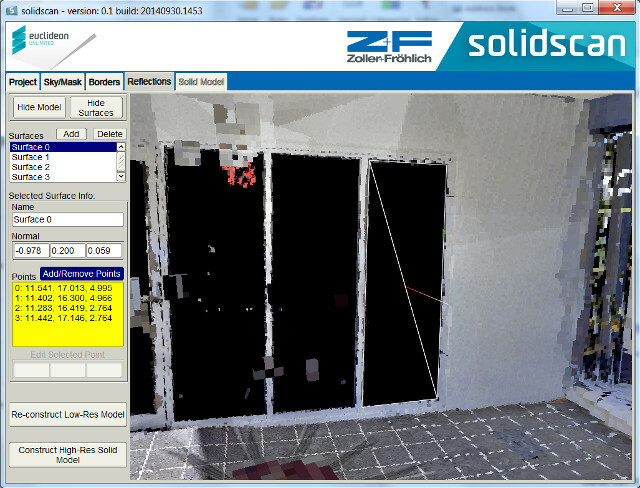 Simply click the ‘Construct High-Res Solid Model’ button to begin the final stage of processing to produce the sealed, colour-blended solidscan point cloud. 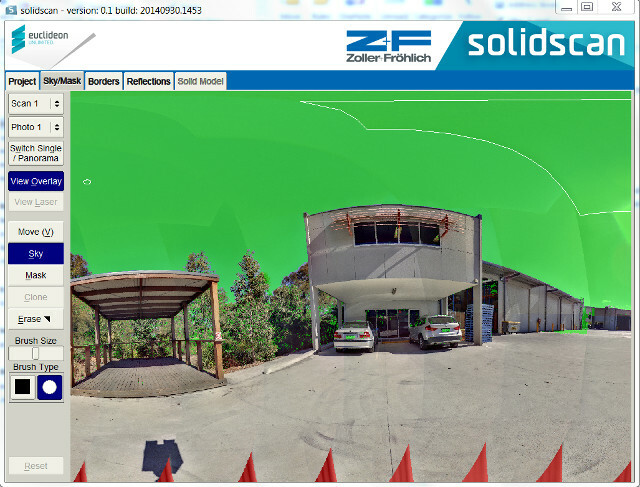 When processing is completed, this point cloud can be placed on a central server and streamed instantly to hundreds of users – provided they have Geoverse MDM installed. Geoverse MDM will instantly open URL links to the file, and best of all no server-side software is required. This process is as simple as placing a file on Dropbox, and even an ordinary computer can become a server of crystal-clear solidscan point clouds to hundreds of users. 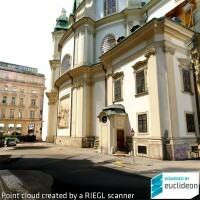 We are happy to announce Solidscan that takes a laser scan and enriches its resolution by around 200 to 1000 times. SOLIDSCAN technology creates many new opportunities for scanning organizations. Traditionally a laser scanner was a tool for measurement – now it becomes a tool for copying the real world. 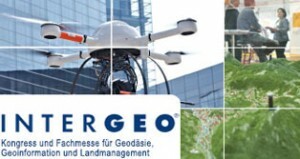 MEIXNER IMAGING and EUCLIDEON at Intergeo in Berlin. Meet us at the Meixner Imaging/ Euclideon booth D3.019 in Hall 3.1. to see our latest products. Come by to get a demo of the latest version of Geoverse and learn how our innovative products are opening up new areas of applications for your business. Searching for new products to represent? Meixner Imaging is currently looking for new resellers worldwide to promote Euclideon’s Geoverse products. 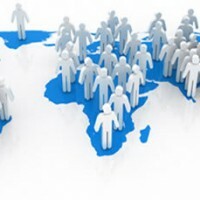 We are supplying the best conditions and always seeking for long term cooperation relationshis. If you are interested in becoming an Euclideon reseller, please contact office@meixnerimaging.com. GEOVERSE MASSIVE DATA MANAGER 1.3.1 (“MDM”) builds on previous offerings by Euclideon. 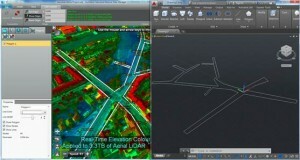 MDM enables instant loading of point cloud data (11 LiDAR formats supported) regardless of size. GIS users can centralize Terabytes of LiDAR on a secure server, and access their point clouds over the Internet using a “Drag & Drop” method as simple as DropBox or MediaFire. Massive data management unlocks new doors for organizations that have invested in LiDAR – the point cloud is liberated and accessible from anywhere in the world. Euclideon’s Unlimited Detail 3D Search Engine technology is the only technology that can accomplish this extraordinary feat. The Unlimited Detail algorithm is so efficient that even the largest of point clouds can now stream easily across ordinary ADSL or even mobile 3G. Von 2. – 4. 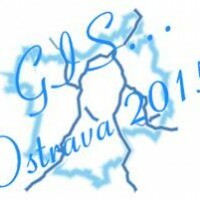 Juli 2014 findet an der Universität Salzburg wieder das AGIT Symposium für Angewandte Geoinformatik statt. Sie finden uns am Messestand 16 und wir sind sehr interessiert spezielle Fragen mit Ihnen erörtern zu können oder besuchen Sie unseren Vortrag „Euclideon Geoverse: Realtime Visualisierung von unlimitierten Datenmengen“ am Mittwoch, 2.Juli um 13:00 im Expo Foyer. Eurosatory is the largest exhibition of Land and Air-land Defence and Security in the world. The Land a nd Airland Defence and Security international exhibition will take place at the Paris Nord Villepinte exhibition center from June 16 – 20, 2014. MeixnerImaging/ Euclideon will be presented together with our partner Photonic Optische Geräte GmbH & Co KG (http://www.photonic.at) at booth #510 in hall 5.